Have you become that your internet browser permanently opens Mywebsearch.com start page instead of your home page? It is a sign that your settings of all your typical web-browsers replaced and your personal computer is infected with browser hijacker. Complete the few simple steps below as soon as possible to remove Mywebsearch.com redirect and stop the ability to penetrate of more dangerous viruses and trojans on your machine. Most often, the Mywebsearch.com browser hijacker affects most common internet browsers like Chrome, IE, Firefox and MS Edge. But such hijacker infections as well may infect other web-browsers by changing its shortcuts (adding ‘http://site.address’ into Target field of web browser’s shortcut). So every time you start the internet browser, it’ll display Mywebsearch.com page. Even if you setup your homepage again, it is still the first thing you see when you start the browser will be the annoying Mywebsearch.com web page. In addition, the Mywebsearch.com browser hijacker can also modify the search engine selected in the web browser. When you try to search on the infected web browser, you will be presented with search results, consisting of advertisements and Google (or Yahoo, or Bing) search results for your query. Among these search results may occur links that lead to unwanted and ad web pages. Also, adware (also known as ‘ad-supported’ software) may be installed on the computer together with Mywebsearch.com browser hijacker. It will insert lots of ads directly to the web pages that you view, creating a sense that ads has been added by the makers of the web page. Moreover, legal ads can be replaced on fake ads that will offer to download and install various unnecessary and harmful applications. Moreover, the Mywebsearch.com hijacker infection has the ability to collect a lot of personal information about you, which can be later transferred to third parties. Therefore it’s very important to clean your system as quickly as possible. Follow the steps below to get rid of Mywebsearch.com search, as well as other malicious software and ‘ad supported’ software, which may be installed onto your system along with it. Without a doubt, the hijacker infection is harmful to your computer. So you need to quickly and completely delete this malware. To remove this browser hijacker, you can use the manual removal which are given below or free malware removal tool like Malwarebytes or AdwCleaner (both are free). I note that we recommend that you use automatic removal which will help you to get rid of Mywebsearch.com easily and safely. Manual removal is best used only if you are well versed in machine or in the case where hijacker infection is not removed automatically. The useful removal instructions for the Mywebsearch.com . The detailed procedure can be followed by anyone as it really does take you step-by-step. If you follow this process to get rid of Mywebsearch.com homepage let us know how you managed by sending us your comments please. Some PUPs, browser hijacking applications and ad-supported software can be deleted by uninstalling the free programs they came with. If this way does not succeed, then looking them up in the list of installed applications in MS Windows Control Panel. Use the “Uninstall” command in order to get rid of them. Press Windows button , then click Search . Type “Control panel”and press Enter. If you using Windows XP or Windows 7, then press “Start” and select “Control Panel”. It will show the Windows Control Panel as on the image below. It will display a list of all software installed on your PC. Scroll through the all list, and uninstall any suspicious and unknown software. Once the hijacker is started, it can also change the internet browser’s shortcuts, adding an argument such as “http://site.address” into the Target field. Due to this, every time you launch the web browser, it will show an annoying web-site. Once is complete, press the “OK” button to save the changes. Please repeat this step for internet browser shortcuts which redirects to an annoying web pages. When you have completed, go to next step. 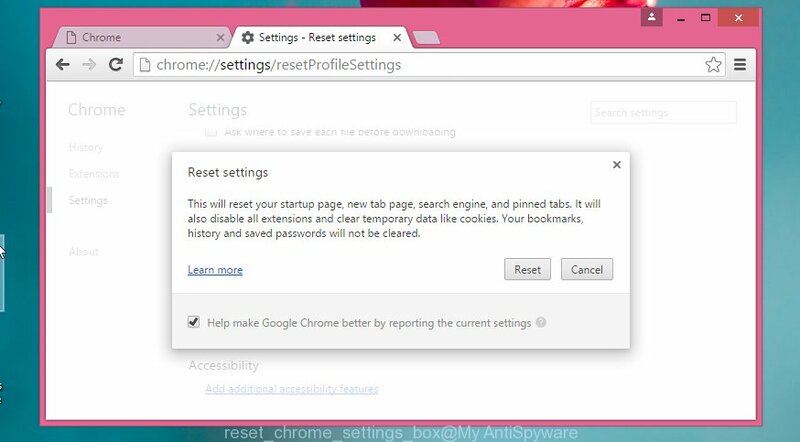 Reset Chrome settings is a easy way to get rid of the browser hijacker, malicious and ‘ad-supported’ extensions, as well as to restore the web-browser’s startpage, new tab page and default search engine that have been changed by Mywebsearch.com hijacker. Resetting your FF is good initial troubleshooting step for any issues with your web-browser program, including the redirect to Mywebsearch.com site. First, launch the FF. Next, click the button in the form of three horizontal stripes ( ). It will show the drop-down menu. Next, press the Help button ( ). In the Help menu press the “Troubleshooting Information”. In the upper-right corner of the “Troubleshooting Information” page click on “Refresh Firefox” button as shown on the image below. By resetting Internet Explorer web browser you restore your web-browser settings to its default state. This is basic when troubleshooting problems that might have been caused by browser hijacker like Mywebsearch.com. First, launch the IE, then click ‘gear’ icon . It will display the Tools drop-down menu on the right part of the browser, then click the “Internet Options” as shown on the image below. In the “Internet Options” screen, select the “Advanced” tab, then click the “Reset” button. The Internet Explorer will show the “Reset Internet Explorer settings” dialog box. Further, click the “Delete personal settings” check box to select it. Next, press the “Reset” button as shown on the image below. When the process is finished, click “Close” button. Close the Internet Explorer and restart your PC system for the changes to take effect. This step will help you to restore your browser’s start page and search provider by default to default state. After completing the manually removal tutorial above all unwanted software and internet browser’s extensions that causes browser redirects to the Mywebsearch.com web-site should be removed. If the problem with Mywebsearch.com hijacker is still remained, then we suggest to scan your machine for any remaining malicious components. run recommended free hijacker removal programs below. Remove Mywebsearch.com browser hijacker infection manually is difficult and often the PC infection is not completely removed. 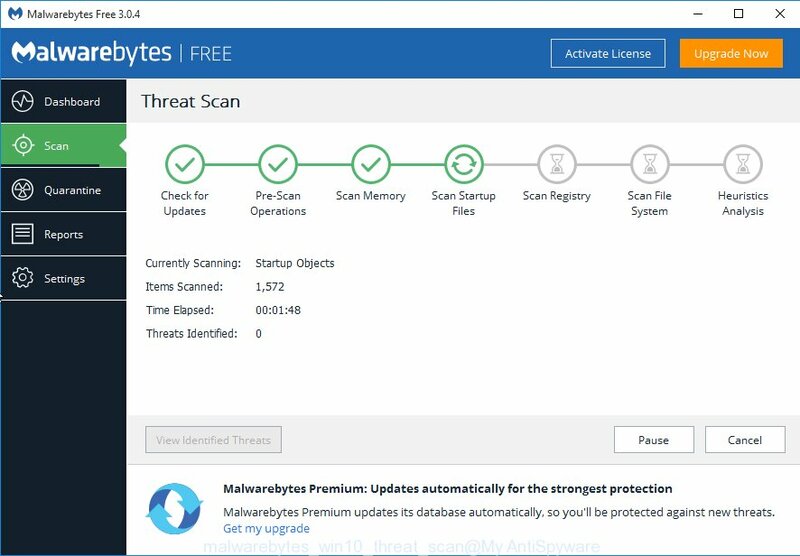 Therefore, we recommend you to use the Malwarebytes Free which are completely clean your PC. Moreover, the free application will allow you to get rid of malware, toolbars and adware (also known as ‘ad-supported’ software) that your PC may be infected too. Once downloaded, close all programs and windows on your PC system. Open a directory in which you saved it. Double-click on the icon that’s named mbam-setup as shown on the screen below. Once setup is complete, you will see window as shown below. Now press the “Scan Now” button to begin checking your machine for the PC infection which cause a redirect to Mywebsearch.com. This procedure can take some time, so please be patient. When the scan is complete, make sure all entries have “checkmark” and click “Quarantine Selected” button. 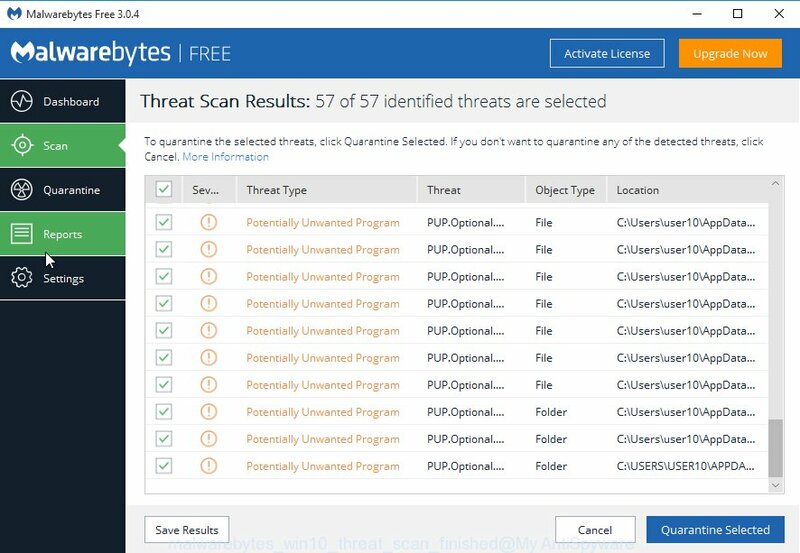 The Malwarebytes will begin removing Mywebsearch.com hijacker related files, folders, registry keys. Once disinfection is complete, you may be prompted to restart your PC. 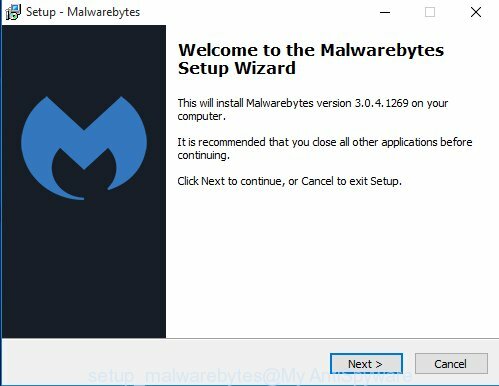 The following video explains tutorial on how to get rid of browser hijacker with Malwarebytes Anti-malware. If MalwareBytes antimalware cannot delete this browser hijacker, then we suggests to use the AdwCleaner. AdwCleaner is a free removal utility for browser hijackers, adware, potentially unwanted programs and toolbars. Double click the AdwCleaner icon. Once this tool is launched, click “Scan” button . This will start scanning the whole computer to find out Mywebsearch.com browser hijacker. When it completes the scan, the AdwCleaner will display a scan report. Review the report and then click “Clean” button. It will display a prompt, click “OK”. It’s also critical to protect your browsers from malicious web pages and ads by using an ad-blocking application such as AdGuard. Security experts says that it will greatly reduce the risk of malware, and potentially save lots of money. Additionally, the AdGuard can also protect your privacy by blocking almost all trackers. Once the downloading process is finished, double-click the downloaded file to start it. The “Setup Wizard” window will show up on the computer screen as shown in the figure below. Click “Skip” button to close the indows and use the default settings, or press “Get Started” to see an quick instructions that will assist you get to know AdGuard better. Each time, when you run your PC system, AdGuard will run automatically and block ads, web pages such Mywebsearch.com, as well as other dangerous or misleading web pages. For an overview of all the features of the program, or to change its settings you can simply double-click on the AdGuard icon, which is located on your desktop. Many programs used to hijack a PC’s browser. So,when you installing free programs, carefully read the disclaimers, select the Custom or Advanced installation mode to watch for optional programs that are being installed, because some of the software are ‘ad supported’ software and potentially unwanted applications. Now your PC system should be free of the Mywebsearch.com startpage. Delete AdwCleaner. 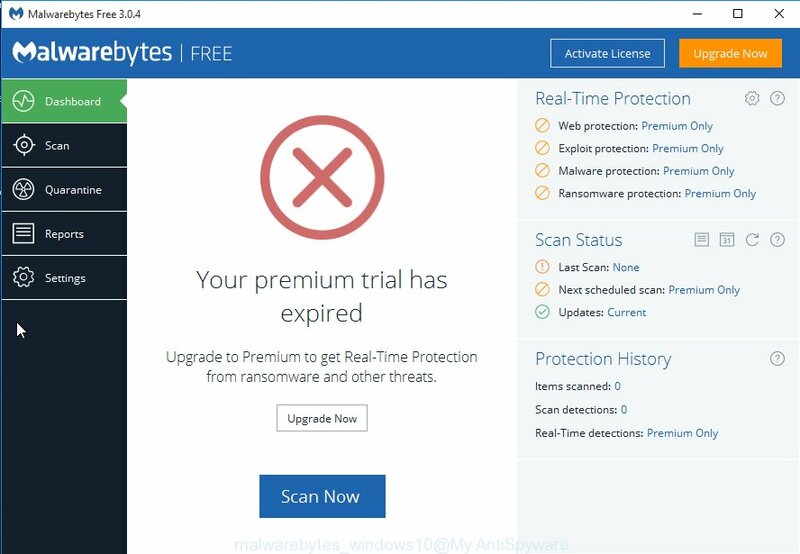 We suggest that you keep Malwarebytes (to periodically scan your PC system for new malicious software, browser hijackers and ‘ad supported’ software) and AdGuard (to help you stop unwanted pop-up ads and harmful web sites). Moreover, to prevent browser hijackers, please stay clear of unknown and third party programs, make sure that your antivirus application, turn on the option to find PUPs (potentially unwanted programs). If you need more help with Mywebsearch.com related issues, go to our Spyware/Malware removal forum.